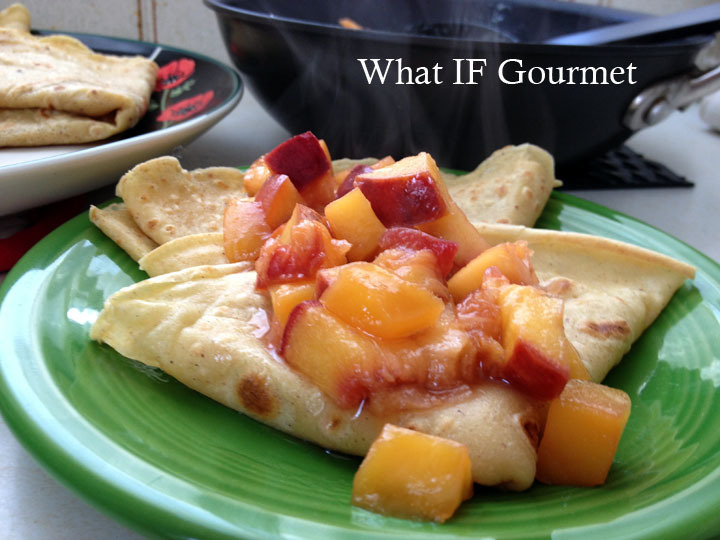 Cinnamon vanilla crepes with mango-peach compote. The Midwestern Gentleman and I love a good crepe. Our former favorite crepe recipe relies on whole wheat flour and buttermilk for a wonderful flavor, texture, and nutritional profile. If you can tolerate gluten and dairy, then I highly recommend it. However, based on my reaction to an elimination diet and on the advice of my rheumatologist, who recognizes a correlation between gluten intolerance and autoimmune diseases like Sjogren’s Syndrome, I’ve gone gluten-free to alleviate some of my worst symptoms. Feeling this good motivates me to stay on track, but I have really missed crepes. Happily, I don’t have to miss them anymore, because we finally hit upon an easy, gluten-free, dairy-free crepe recipe (emphasis on easy!) that we both find delicious and satisfying. We love crepes for breakfast topped with fruit, or crepes for dinner stuffed with savory goodness, like mushrooms and onions. This recipe can go either way. 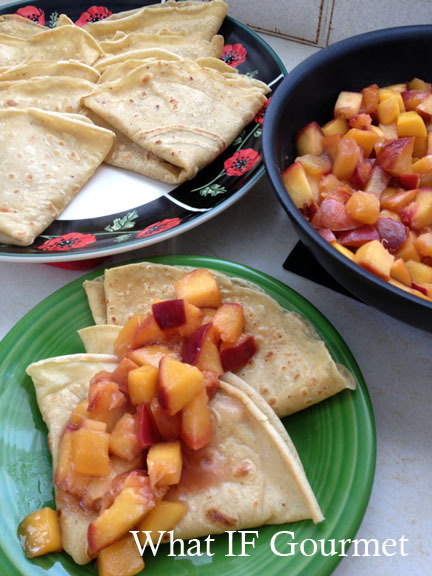 The resulting crepes are tender but also strong enough to unfold and roll up around a filling. For a really incredible (and easy) weeknight dinner, drizzle savory, stuffed crepes with Roasted Red Pepper Cashew “Cream” Sauce. This creamy, vegan sauce from Dispatches from the Gypsy Roller is smoky-sweet and richly flavorful. We love it over crepes, and also as a sauce on homemade gluten-free pizza. If you make this delicious and nutritious sauce ahead of time, it keeps well in the fridge for up to a week, ready to dress up your weeknight meals at a moment’s notice! Vigorously whisk together crepe ingredients in a medium-sized bowl. Let batter stand for ten minutes. Ladle 1/4 cup batter onto a hot, 10-inch crepe pan or round griddle, tipping the pan as you pour to swirl the batter around in an even layer that coats the entire pan. Cook over medium-high heat for about 30 to 40 seconds, then flip. Cook for another 30 to 40 seconds on the other side, fold into quarters, and set on a covered plate to keep warm as you cook up the rest of the batter. Grease the pan with a little bit of coconut oil wiped out with a paper towel between each crepe to prevent sticking. Makes about a dozen crepes, 3-4 servings. 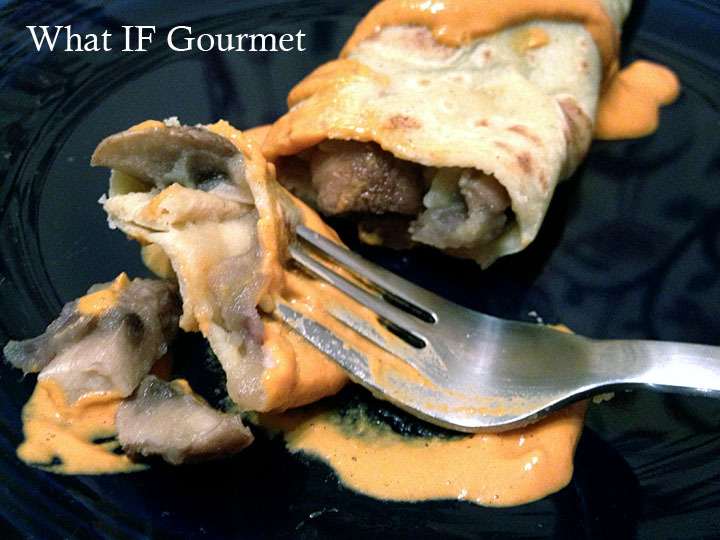 Savory crepes stuffed with crimini mushrooms, red onion, and smashed Yukon Gold potatoes simmered in Madeira wine, and drizzled with Red Pepper Cashew “Cream” Sauce (see link to recipe, above). 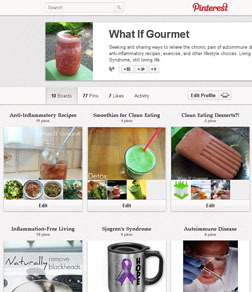 This entry was posted in Anti-Inflammatory Ingredients, Breakfast, coconut oil (virgin/ unrefined), Dairy-free, Desserts, Entrees, fruit, Gluten-free, Recipes, Snacks, spices, Vegetarian. Bookmark the permalink. Hannah, your sauce is an inspiration! It’s now one of our go-to recipes. Thanks again for your wonderful blog!